Since Oct 1983, when the first MRT Line, the North-South Line was constructed, till date, there are now three completed Lines in operation, with two under construction. The three operational Lines are the North-South Line, East-West Line and North-East Line. Under construction are the Circle Line and Downtown Line. Of the completed and operational Lines, Asiatic is proud to be the supplier of the (Shinwa) cooling towers with total refrigeration tonnages of 14,250RT, as well as 96 nos. of chilled & condenser water circulation pumps in the central air-conditioning systems for all the 16 air-conditioned stations of the North-East Line. 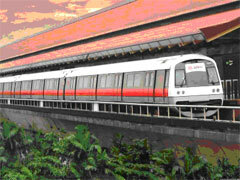 Currently, Asiatic is still delivering to 18 stations of the on-going construction of Circle Line. A total number of 126 units of Monoflo DIN-Master end suction back pullout centrifugal pumpsets, comprising various models from the smallest size of DMT65-260 up to the largest size DMT125-400, will be supplied. The hydraulics of these pumps are either fully stainless steel constructed; or with cast iron body, bronze impeller with stainless steel shaft construction. Besides pumps, Asiatic is also supplying & installing cooling towers to 22 stations of Circle Line, with a total refrigeration tonnage of 13,800RT. In hand, Asiatic has received orders to supply pumps and cooling towers for two stations - 'Marina Bay' and 'Bay Front' stations, of the Downtown Line, which is currently under construction.